Daily brushing and flossing of your teeth is the most effective way of preventing gum disease. Although your dentist and hygienist routinely remove build-up of tartar or plaque during your appointments, if you do not take care of your teeth you may develop gum disease. This can cause your gums to recede or pull away from your teeth, leaving them weakened and at risk of falling out. Swollen, sore or infected gums may be caused by gum disease or gingivitis. This is very common and is experienced to some degree by half the adult population in the UK. Bad breath and bleeding gums when you brush your teeth may indicate that you are at risk of developing gum disease. When treated early, with the removal of plaque and tartar and thorough oral hygiene, most cases of gingivitis settle down and the gum returns to normal. But if it is left untreated, more serious problems can occur including the formation of a gum abscess, receding gums and loose teeth. Some people are more vulnerable to the effects of plaque and tartar and the build-up can cause pockets to develop around their teeth. These pockets are very difficult to clean, so further plaque builds up inside them and the disease progresses. 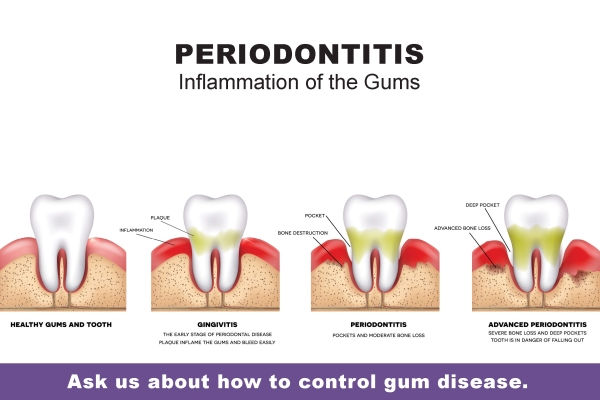 The branch of dentistry that treats these problems is called periodontics.